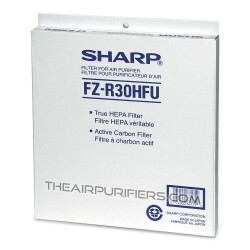 Sharp FPR30CX (FP-R30CX) HEPA Filter and Carbon Filter Replacement. Sharp FPR30CX Filters There is 1 product. Sharp FZR30HFU (FZ-R30HFU) is Original Sharp Filter. Sharp FZR30HFU contains Sharp HEPA filter and Carbon filter for Sharp FPR30CX (FP-R30CX).